"The connection to Mother Earth, the Sun - our Grandfather, the Moon - our Grandmother, the Water, all of the Four-Leggeds, the Winged Ones, Those that Swim, Those That Dwell Within the Earth, Our Ancestors who came before us, Those Coming behind us ..... The Creator, All of Creation, is the basis for all that we do. For we pass as a single drop of rain in a mighty thunderstorm." 3rd Annual Mining Alternatives Summit! Comprised of the Bad River, Keweenaw Bay, Lac Courte Oreilles, Lac du Flambeau, Red Cliff, Sokaogon and St. Croix Bands of Ojibwe or "Chippewa" Indians. 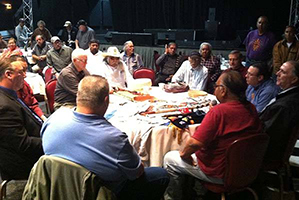 Each Band is a federally recognized Tribe, and is a Sovereign Nation enjoying a government-to-government relationship with local, county, state and federal government agencies. 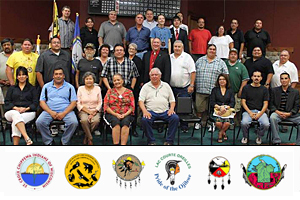 The Federation encourages all Ojibwe Tribes in North America to join. To protect the natural resources within the ceded-territory and across Mother Earth. 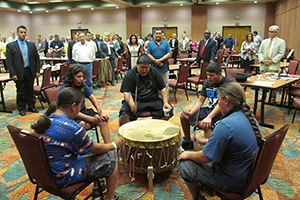 To diversify economic and educational opportunities, increase the level of health care, further the political position and expand the social status of Tribal Members and Descendants of the member Tribes. To ensure a quality of life that members, descendants and future generations can enjoy in perpetuity. Collectively, the Bands have united to pursue common interests politically, environmentally, economically and socially. Preservation of the inherent right to hunt, gather and subsist within the area known as the "ceded territory" is a primary initiative of the Federation. The Federation was born out of a need to preserve the collective sovereignty and self-determination of the Anishinabe or "Ojibwe" (Chippewa) People. The Chippewa Federation was born out of the need to preserve the collective sovereignty and self-determination of the Anishinabe or Ojibwe (Chippewa) people whose existence predates the US federal government and state of Wisconsin government. The Federation is dedicated to the protection of our inherent right to exist in the ways of our Ancestors, which were preserved in the Treaties of 1837, 1842 and 1854, and reaffirmed in federal court in 1987. 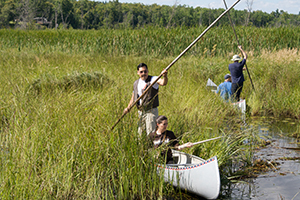 The Ojibwe treaty rights have held up in state, district and federal court. In 2015 the United States Supreme Court refused to hear the state of Wisconsin's appeal to the Ojibwe night hunting case, bringing to a close a long and arduous chapter in the struggle to uphold the rights for generations to come. Acknowledging that we are of the Earth, resource protection and conservation is a main priority. We also recognize our connection to the other Tribes of the Great Ojibwe Nation and all Tribal Nations. Preservation of our culture, language and traditions, as well as the continued development in the areas of education, economic base and health care are paramount to the success of our member Tribes and Nations as a whole. Looking seven generations ahead, we strive to create and improve opportunities for those coming behind us. For inquiries please fill out our contact form.